Villas at Swans Nest in Breckenridge Real Estate is a wonderful condo complex between Breckenridge and Frisco. 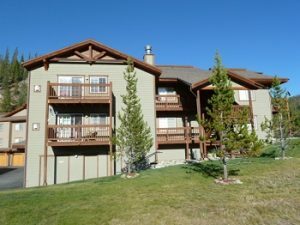 Located just north of Tiger Road on Highway 9, Villas at Swans Nest are great condos to get away from it all in Breckenridge Real Estate. Built in 1999 there are a total of 138 condos comprised of 26 – one bedrooms, 112 – two bedrooms and some of these residences have dens as well. The size of the properties range from 841 – 1347 square feet. Some of the units have detached or attached one car garages while each condo has a washer/dryer in the unit. There is also onsite common area hot tubs for soaking away the aches from the days activities. The dues remain relatively stable and they include heat, gas, water/sewer, trash pick-up and snow removal. For additional information about the properties currently for sale in Villas at Swans Nest, and for a complete listing of homes, townhomes and condos for sale in Breckenridge CO Real Estate, contact Justin and Krystal Knott at LIV Sotheby’s International Realty.